Although everyone is vulnerable to back pain, the data suggests a significant increase among those falling under the range of 35-55 years of age. Whether the back pain is acute or chronic, acupuncture has gained recognition as a therapy that complements as well as offers an alternative to western medicine. 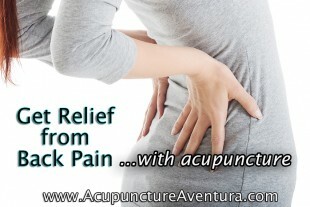 Acupuncture for back pain works and can give you significant relief often times within the first few treatments. If you’re experiencing back pain and other methods of treatment have failed, you owe it to yourself to try acupuncture. What Are the Risk Factors and Causes of Back Pain? In the USA and UK especially, risk factors for this medical problem are abundantly found. Even though back pain is generally common in females, the condition can also be influenced by age, physically strenuous work or exercise, pregnancy, obesity, mental stress, anxiety, depression, sedentary routine, and smoking. Most people have no idea that the way they sit, stand, move, and even lie down is crucial in preventing some serious pain later on. Awkward or abrupt bending, lifting, pushing/pulling something, twisting, over-stretching all lead to muscle tension. Even the time that one spends standing, bending, maybe even sitting in a hunched position, especially if the person is not wearing flat shoes, can be trouble since the body is deprived of a good support. Activities like driving for a long time should also be kept minimal. Medical issues, too, like strained muscles and ligaments, a muscle spasm, ruptured or bulging disks, arthritis, abnormal curvature of the spine, osteoporosis, tumor, and infections may also relate to this. According to one recent article online, nearly 3 million people are being treated through acupuncture in the US. A majority of these people are pregnant women who do not want to use drugs and people who do not trust the physicians or Western medicine. If their individual symptoms respond to it, they eventually report back as being more active and involved in a healthier social life. Originating from 2000-year old Chinese traditions, inserting fine needles in the body at particular acu-points, (There are approximately 365 or so in the entire body) is believed to help the patient in many ways. A relaxing session allows the body to release natural painkillers, or endorphins, while the needles facilitate energy and blood flow, relieving spasm and inflammation in the area. The technique gives both short-term and long-term pain relief. Sometimes we employ acupuncture along with other methods like moxibustion, tuina massage, cupping, and electro-simulation if the patient is not wearing a pacemaker. In 1997, the National Institutes of Health declared acupuncture useful for dealing with back pain issues. Acupuncture can be an effective solution for you! Do you have any questions about acupuncture? Feel free to call us at 786-537-7022 to get started!